Welcome back to the Arne Wellness Center blog. If you’ve been in a car accident, chances are you’re experiencing back pain. One of the most common forms of back pain experienced after an auto accident is lower back pain. Pain in the low back can interfere with your ability to perform everyday movements such as walking, sitting, and standing comfortably. What’s more, lower back pain can hinder your ability to perform your best at work. According to the American Chiropractic Association (ACA), low back pain is one of the main reasons people miss work. Whether you sit at a desk in front of a computer all day or you work in a manual position that requires you to stand, bend over, twist, and lift heavy objects, back pain can limit these movements. 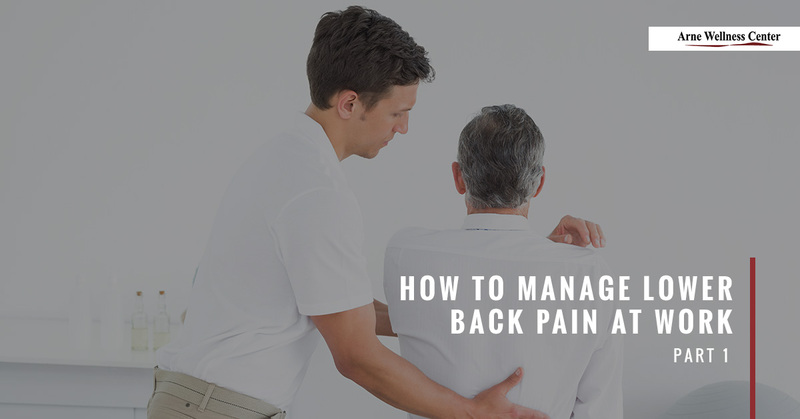 Below are some tips to help you manage your lower back pain while you’re at work, which can reduce your pain during your auto injury recovery. Stretching is one of the best ways to prepare your body for physical exertion and to alleviate muscle cramping and stiffness. Simple stretches — that are chiropractor-approved, of course — can release the pressure on your lower spine if you sit for an extending period of time. Follow this link to access a few simple office stretches. For those of you who work jobs that are more physically engaging, stretching before and after work is crucial. For manual workers, here are some stretches that can ease lower back pain. You’ll want to make sure your back is properly supported for good posture while at work. There are numerous back supports to choose from for any industry. If you sit in a chair or drive a vehicle, invest in a good lumbar support system or try sitting on an ergonomic swiss ball chair. For manual workers, back support belts and braces will support your back when moving and lifting. For those of you who sit at a desk, it’s easy to fall into the trap of remaining seated for eight hours. However, the human body was not designed to stay in a seated position, and that much sitting can cause back pain. To alleviate pressure on the lower back and hips, get up and walk around during the day. If you have a hard time remembering to get up, set a timer or schedule it into your calendar. If you work from home, it might be worth investing in a desk that can move up and down for seated and standing positions. Chiropractic care is one of the most effective ways to treat and relieve injury-related back pain. If you would like to schedule an appointment to begin auto injury treatment in Littleton, call Arne Wellness Center today to get started.